A brewbup is a restaurant and brewery that sells most of its beer production on site where beer is brewed primarily for sale in the restaurant and bar. The beer is often dispensed directly from the brewery's storage tanks. Where allowed by law, brewpubs often sell beer 'to go' and /or distribute to off site accounts. If the brewpub begins to sell more the 75% of beer production off-site then it usually is re-categorized as a microbrewery. Before the development of large commercial breweries, beer would have been brewed on the premises from which it was sold. Alewives would put out a sign such as an ale-wand to show when their beer was ready. Gradually men became involved in brewing and organized themselves into guilds; as brewing became more organized and reliable many inns and taverns ceased brewing for themselves and bought beer from these early commercial breweries. The trend toward larger brewing companies started to change during the 1970s when the popularity of the Campaign for Real Ale (CAMRA)'s campaign for traditional brewing methods, and the success of Michael Jackson's World Guide to Beer, encouraged brewers in the UK such as Peter Austin to form their own small breweries or brewpubs. In 1979 a chain of UK brewpubs, known as the "Firkin" pubs, started. Interest spread to America, and in 1982 Grant's Brewery Pub in Yakima, Washington was opened, reviving the American "brewery taverns" of well-known early Americans as William Penn, Samuel Adams and Patrick Henry. The growth since then has been considerable: the Association of Brewers reports that in 2006 there were 1,389 regional craft breweries, microbreweries and brewpubs in the United States. In no particular order, below you will fins some of America's greatest brewpubs. McMenamins High Street Brewery & Cafe Eugene, OR - The first microbrewery in Eugene since Prohibition Days, High Street Brewery & Cafe is housed in a renovated 1900s house on the fringes of the city's center, complete with a backyard beer garden where ales are enjoyed under the shade of fir, ash, hawthorn and tulip trees in the summer (warmth provided by an outdoor fire pit in winter). 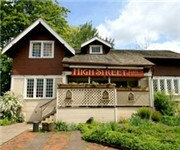 One of Eugene's smallest breweries, High Street produces some of Oregon's finest ales. Our handcrafted brews, like Heavy Hand and the aggressively hopped Poweramp IPA are not around long (once the word gets out). 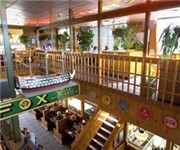 Our homey, comfortable and enjoyable atmosphere appeals to people of all ages and from all walks of life. Our Cafe is liberally decorated with original artwork on our walls, doors and equipment. Selin's Grove Brewing Company Selinsgrove, PA - Selin’s Grove Brewing Co. opened in 1996 and was fortunate to call home a beautiful Federal style stone governor’s mansion. This historic building was built in 1816 by Pennsylvania’s third and only three term governor, Simon Snyder, for whom our county was named. The building remains remarkably intact and is on the National Historic Register. The Selin’s Grove Brewing Co. is housed on the ground floor in the governor’s kitchen, complete with two walk-in fireplaces. Russian River Brewing Company Santa Rosa, CA - Russian River Brewing Company is a brewery and brewpub located in downtown Santa Rosa, California. Russian River Brewing Company was created in 1997 when Korbel Champagne Cellars of Guerneville, California decided to try their hand at brewing beer. Brewer Vinnie Cilurzo was hired as brewmaster. Korbel quit the brewing business, and sold the brewery to Cilurzo and his wife Natalie in 2002. Vinnie's Blind Pig brewery changed names to Russian River, remodeled and expanded in 2004, eventually moving to Santa Rosa, at their current 4th Street location. Cilurzo is is regarded as one of the most innovative microbrewers in the country and credited with inventing the beer style DIPA (Double India Pale Ale), known alternately as Imperial IPA, when he was the head brewer at Blind Pig Brewing Company in Temecula, California. Great Lakes Brewing Company Cleveland, OH - Great Lakes Brewing Company is a Cleveland, Ohio-based regional brewing and restaurant company which has been in operation since 1988. The brewery has been cited as important to Cleveland's local identity. Established by brothers Patrick and Daniel Conway, Great Lakes Brewing Company started out as the first brewpub and microbrewery in the state of Ohio, remaining at their original location, though expanded to several adjoining properties. 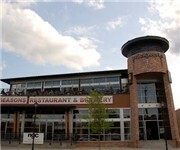 The brewery and restaurant are located in the Ohio City neighborhood of Cleveland, Ohio across the street from St. Ignatius High School and the West Side Market. The Jesuits at St. Ignatius have blessed the brewing vats. Pizza Port and Port Brewing Co. San Clemente, CA - Pizza Port was established in March of 1987 when we started making pizzas in our present location in Solana Beach! We started brewing beer as a hobby and as we began brewing more than we could leisurely drink, we really wanted to share some of the incredible brews that we created for fun with our customers too. We installed a 7 barrel brewery and served our first handcrafted beer brewed on the premises in October of 1992. Pizza Port is devoted to total customer satisfaction by providing the highest quality and the best service humanly possible while having too much fun. We take ultimate pride in our standards by offering a completely unique dining and drinking experience. Victory Brewing Company Downingtown, PA - Victory Brewing Company (Victory) is a brewery founded in 1996 in Downingtown, Pennsylvania, USA. The main brands are HopDevil, Prima Pils and Storm King, which are distributed in 23 states. The brewery uses an automated, energy recovery, 50 BBL system made by Rolec in OberBayern, Germany. Victory also brews using traditional methods where appropriate, such as using the energy intensive decoction process for production of certain German style lager biers. Victory use whole hops. The restaurant was completely remodeled in spring of 2008 with a new focus on smoked barbecue. A growler filler was installed during the renovation that allows any of 20 draft beers to be routed to the counter-pressure growler filler. 5 Seasons Brewery Atlanta, GA - Five Seasons is more than a place to knock back beer. An elegant interior beckons with softly lit tables and an expansive dining area. The brewery, visible from the main bar and restaurant, adds a gilded note of coppery class to the swanky establishment. The menu, rightfully fawned over by patrons, includes delectable cuisine with dishes from Japan, Germany and America. The grilled pizza tops the list. If you're a daring sort, try the ostrich steak, or satisfy a seafood hankering with the spicy scallops. The local brewery has 13 beers on tap. Pyramid Alehouse Brewery Seattle, WA - The Seattle Alehouse, our original location, offers a world of extraordinary tastes waiting to be explored on draft including our year-round beers, rotating seasonals, as well as a few unique Pyramid offerings you won’t find anywhere else. Enjoy a pint, explore a Pyramid Sampler, or order a growler of brewery fresh beer to go. Pair your brew with a tasty selection off of our full menu of classic brew house cuisine. Located across the street from Safeco Field, home of the Seattle Mariners, and just a block south of Qwest Field - the Alehouse is a great place for friends to gather before or after a baseball, football or soccer game. Pelican Pub and Brewery Pacific City, OR - Welcome to the Pelican Pub Brew House. Darron Welch is the Head Brewer here at the Pub. Before becoming the Head Brewer, Darron was an assistant brewer for Adler Brau Brewery in Appleton, Wisconsin, but before that, he home brewed for many years in his hometown of Eugene, Oregon. Darron was a key player in the creation of the Pelican Pub Brewery. He helped build the Pelican Pub from the ground up, designing the brewery layout and production flow as well as all of the fine Pelican beers. Montgomery Brewing Co Montgomery, AL - Welcome to the Montgomery Brewing Company, better known as "The Brew Pub" to locals, in Montgomery, Alabama. Our unique, historic setting in Downtown Montgomery creates the perfect atmosphere for a one of a kind dining experience! We are famous for our high quality micro-brews and our extensive lunch and dinner menus. We also feature the best live entertainment every Friday and Saturday night with some of the most in demand entertainment performing. Portsmouth Brewery Portsmouth, NH - The Portsmouth Brewery, New Hampshire's original brewpub, has been serving great food and outstanding handcrafted beers in a friendly, lively atmosphere since 1991. Our most popular beer is a friendly, golden ale that pairs well with a wide range of foods and occasions. 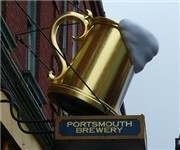 Tours of the Portsmouth Brewery are offered on Thursdays, Fridays & Saturdays at 1:00 & 3:00 PM. At the Brewery, we proudly serve a wide range of handcrafted beers. Snake River Brewpub Lander, WY - Make yourself at home at Snake River Brewing in the heart of the Teton Mountain Range. All roads, trails, bike paths, climbing routes and ski runs lead to “The Brewpub”. Considered by many to be Jackson’s “living room”, our pub provides locals and visitors alike a unique social experience. We are non-smoking (always have been) and family-friendly. We’ve been around since 1994 when Joni and Albert Upsher decided to open the restaurant and brewery. In 2007, the Upshers retired and sold to Ted and Noa Staryk. Snake River Brewing has always been family owned and operated. Everything here is handmade, we even have our own bakery. 2nd Street Brewery Milwaukee, WI - From the machinery used to make the beer to the fuel used to power the equipment, recycling is playing a key role in the development of the Milwaukee Brewing Co.'s Second Street Brewery. The new brewery at 613 S. Second St. is being built by Jim McCabe, owner of the Milwaukee Ale House. The brewery will include a two-story tasting area, which will take up about one quarter of the brewery's space, McCabe said. The site also will feature a few hundred square feet devoted to commemorating Milwaukee's brewing history. Fish Tail BrewPub at Fish Brewing Company - Fresh beer and cider, fine food, and enduring friendships are what life in the Great Pacific Northwest is all about. It’s an honor being part of this tradition. From our home in beautiful Olympia, Washington, Fish Brewing Company has been hand-crafting ales of Northwest proportions since 1993. Then, using a system cobbled from brewing and dairy equipment, we brewed for our neighbors up and down Puget Sound. Growing steadily since, Fish is now an award-winning craft brewer with distribution throughout the Pacific Northwest and beyond. McMenamins Lighthouse Brewpub Lincoln City, OR - Perched near the towering Cascade Head in the Pacific Ocean, the Lighthouse was the first brewpub to open on the Oregon coast. McMenamins' Lighthouse Brewpub, in Lincoln City, serves up classic pub fare in a seaside setting complete with an onsite brewery. With a scent of sea salt on the air, enjoy McMenamins handcrafted ales, wines and spirits in a casual, family-friendly environment, or take in the view of the brewery where the open fermenters afford a view of brewing in action. McMenamins' pubs are truly places for families and friends, as they have been since 1983. Inside all of our places inspired artwork abounds and cozy booths and long, family-style tables invite folks of all ages to enjoy great conversation over a hearty meal and the glint of a fresh pint. We produce a whopping 200-plus ales each year which means you'll always have a wide selection to choose from. Classics such as raspberry-tinged Ruby, medium-bodied Hammerhead and dark, strong Terminator Stout are always available. Harper's Restaurant and Brewpub East Lansing, MI - Harper's is the only Microbrewery in East Lansing, and home to a variety of original beers. These beers span from Pale Ales and Wheat beers to IPA's and Stouts. Jaipur Restaurant and Brewpub Omaha, NE - We are a two barrel (64 gallon) brewery located within the restaurant. All of the brewing process takes place right here! Our beers are created to compliment the cuisine. The beer we serve is fresh because it is made with all natural ingredients. Malted barley is added to water and boiled for nearly an hour. Fresh hops are added throughout the boil to add both flavor and aroma. This un-fermented beer is called wort and is pumped from the boil room to one of the three fomenters we have in the restaurant. Old Hayward Eatery and Brewpub - Old Hayward Eatery & Brewpub offers a wide selection of home-style favorites in a cozy, inviting atmosphere. Our caring staff and talented chefs are dedicated to making your dining adventure fun, relaxing, and pleasurable. Whether you bring your family in for quality time together or gather with your friends for a hearty meal, Old Hayward Eatery & Brewpub is the perfect place for you. To accompany your dinner, Old Hayward Eatery also features a wide selection of our own home-brewed beers. McMenamins Six Arms Seattle, WA - The oddly named Six Arms is not so oddly named when you consider our beer-label logo showing a Hindu idol with her six, sinuous arms aloft. Inside the bustling pub, enormous windows and an impressive three-dimensional sculpture of our multi-armed mascot make Six Arm's a destination for Seattle's funky Capitol Hill neighborhood. Here you'll find more interior space than in many McMenamins pubs -- filled with a long wooden bar, booths, an upstairs section with wrought-iron cafe tables and mini booth -- and our largest collection of chandeliers. Nestled on Pike Street halfway between Capitol Hill and downtown shopping, the airy pub features daily specials, a hearty menu of classic pub fare and handcrafted ales brewed right on the premises.